The last time I checked in I was riding a motorized cart around Target. Things have drastically improved, and as you can see above I put on real clothes and acted like a semi-normal human over the weekend. Ok, they were actually running tights, but at least I didn’t wear sweatpants out to dinner. Today I had my follow-up appointment. All of my tests came back normal; bone density, calcium, vitamin D, and hormones. My doctor also told me that I could stop using crutches but still limit my activity. Although, this was all good to hear, I’m not really feeling confident in my doctor. I don’t feel very encouraged when I visit with him, and I don’t feel that he is being proactive with my recovery plan. Actually, I’m pretty bummed out in general today. I did have a great weekend with my family and teammates. 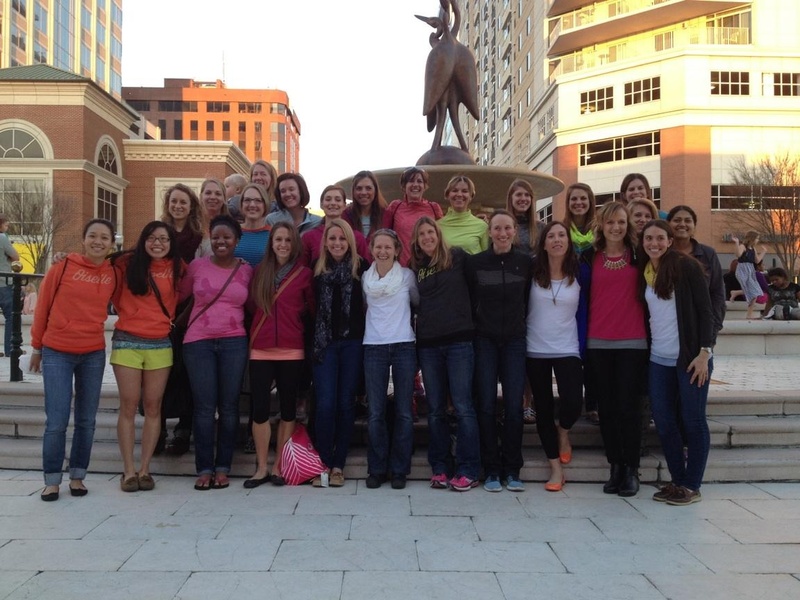 We had our Oiselle team meetup at Shamrock this year, and I was so happy to be able to cheer for my teammates, many of whom got PRs on the flat, fast course. As always, it went by too fast and I’m looking forward to the next meetup in Boston in a few weeks. Emmaline was so excited to meet so many new faces this weekend, and she napped for almost three straight hours after my family left yesterday, which is a new PR for her as well. She has actually been talking all day long, which is a totally new thing, saying mama, Emma, and what sounds like Bella and Emmaline. I know logically that she has no idea what she’s saying but it’s still cute.